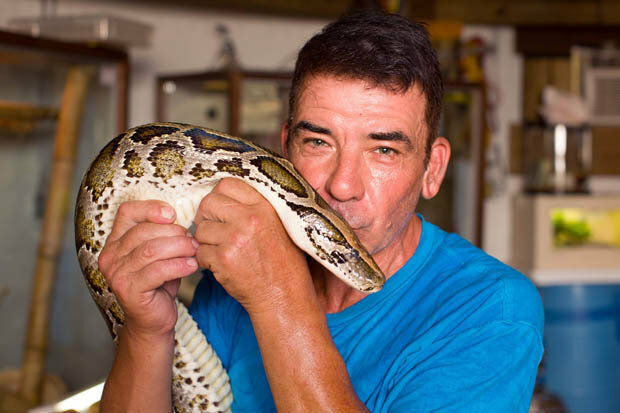 Meet a 58-year-old man from Florida, USA, whose only passion in life are snakes. Albert Kilian lives in a one-room house fully packed with slithering friends of all kinds, including a Burmese python, a king cobra and many more. Since his childhood Albert was interested in serpents, and by the age of 20 he already had thousands of venomous and non-venomous snakes. By the age of 20 he already had thousands of venomous snakes. That man is crazy. American government should test is brain for damages in the brain.